Event-based Goals aren’t a new feature in Google Analytics, but it’s safe to say a lot of users still prefer old-fashioned Destination Goals over the much more dynamic event goal. It’s true that Destination Goals are often simpler to implement – everyone has Pageviews by default with Google Analytics. More and more we find that there are just too many cases where a single Pageview doesn’t match the interaction we want to record. Loading a page is one thing, but the interactions that happen after page load can be more valuable to record. Why the Emphasis on Events? Put simply: Versatility. Events are designed to capture all of the non-pageview stuff that we might be interested in on a site. That includes all the little interactions that happen within pages, like clicks on downloads, or AJAX elements that bring in new content without a reload, links to third-party websites, or plays of videos embedded in the page. Basically, anywhere someone can click, move or view the site, we can track. Plus, we can get a rich array of information on any of these interactions. Event structure gives us four unique fields of information called the category, action, label, and value. Especially when we variably add information to these values, the possibilities are endless. Ok, so we’ve made the case for Events. But what do we get by using Events as Goals? If Events, in general, give us versatility, Events as Goals give us precision. This is a good time to mention a key difference between Events and Goals. Events can happen several times per session. Goal Completions only happen on the first occurrence. So lets say you use video views as an Event Goal Completion. A user who watches five videos in a session will count for one goal completion but five events. Event value is a highly underused feature. And while I think it deserves a little more play, it also comes with some responsibility. A lot of marketers avoid this field because it may require a developer to pull dynamic information off the page, or sometimes, a straightforward value is a hard to find. It might be hard to match an accurate monetary value with an interaction. In fact, if we are that confident about monetary value, it’s likely a transaction and Enhanced Ecommerce tracking would be a better solution. But there are many cases where we can apply a unique value to an event. One case might be lead value. You know all that extensive research you’ve done on cost per acquisition and value per lead? This is a great place to capture that detail and enrich your reporting. Destination Goals allow us to put in a single, arbitrary Goal Value. 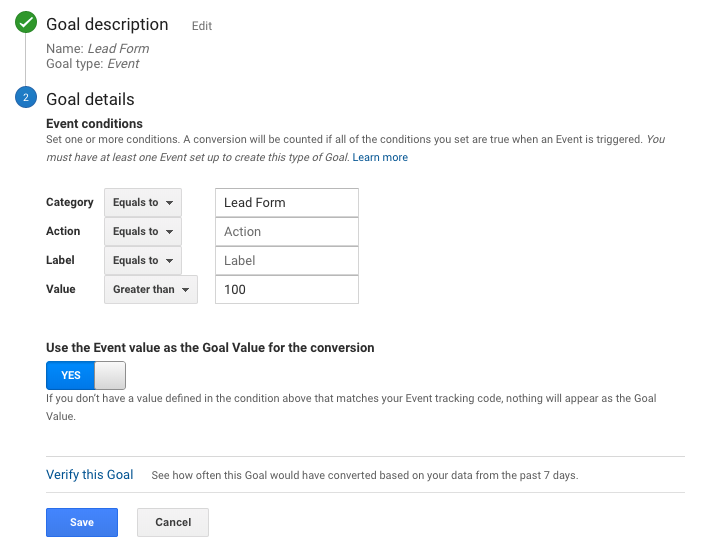 Event Goals, however, allow us to change this value before we send it to Google Analytics – perhaps based on behavior from the user or the type of event. Goal Values in Acquisition Reports – Ever want to put a value to a traffic source? Adding this value opens you up to a new metrics within your acquisition reporting. Multi-Channel Funnels/Attribution reporting – Access to traffic-level data is one thing, but goal values also introduce the possibility of attribution. Page Value Reporting – It’s one thing to know where users are converting on your site. A metric that evaluates the impact of that conversion begins to provide true insight. Your Acquisition reports will show goal values as a metric. You can also use these values for more advance analysis, using the Multi-Channel Funnel reports. Beyond the event value metric, we have a lot of flexibility in creating event Goals. First, you’ll head to the Goals section of your View Settings and create a new, Event Goal. Because there are four fields for Events, we can use any combination to trigger the goal. Say you have an event category for form submissions and variable info about that submission in other fields. Set up your goal to include any event matching only that category. Then, maybe you want to only count form submissions on a particular lead for. Store that unique form as the action and trigger a goal when the form matches those two conditions. The real value here is any value left blank in your goal can become variable information in your reporting, revealing more about how and why a user converted. Last, the naming convention is always important when it comes to Events but it’s crucial to have an established schema for event Goals. Google Tag Manager is currently the most versatile solution for adding Events to your site using their built-in Google Analytics tag template. Any variable you can create within GTM can be added as an event field to bring rich data into your reports. If you’re using GTM, we’ll you’re in luck! We have developed a whole library of Google Tag Manager recipes you can add to a container to quickly begin event tracking on a host interactions from video plays, to scroll tracking, to outbound link clicks. If you happen to be using Google’s new Global Site Tag, the code changes and is more customizable. This method gives developers flexibility in attaching Events to link clicks, form submits, AJAX Events or any other onsite element. 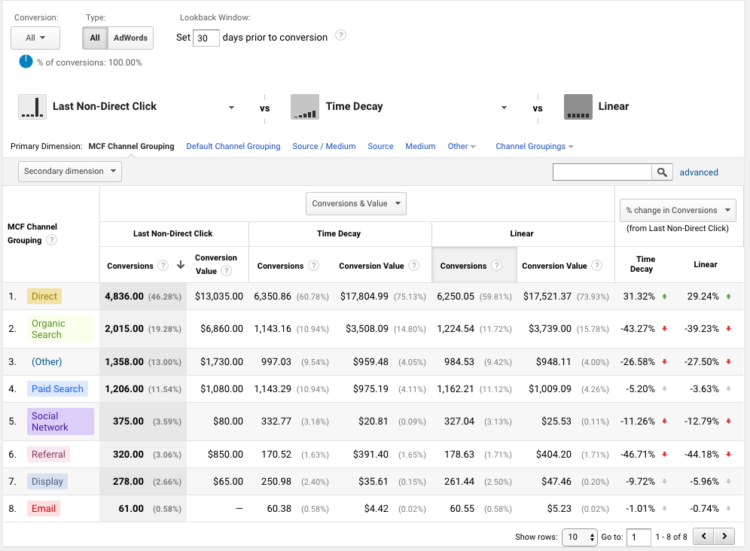 Google Analytics offers a lot of flexibility for adding these value to your reporting. This is evident in the host of third-party tools that integrate with GA to share event data. Common examples include call tracking solutions, live chat tools, and landing page builders. These integrations will give a range of information from every click registered on the site to adding in offline information for phone calls. 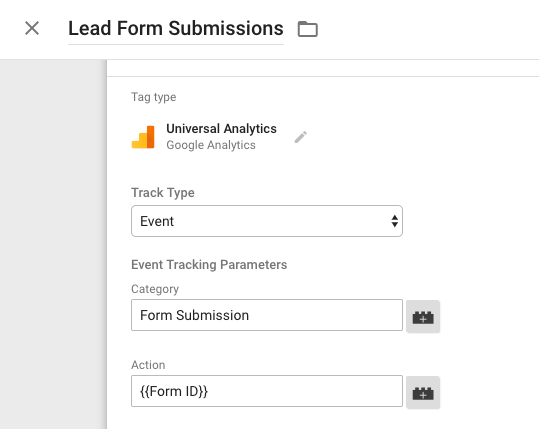 Just announced – Google Analytics 360 and Salesforce have teamed up to make it easier to capture all of the important stuff that happens after a lead is submitted, like qualifying leads, converting to Opportunities, and closing deals. After setting it up, Salesforce will send data back to Google Analytics in the form of events, importing changes to Leads and Opportunities (with Values!) and connecting to the original user that submitted a lead/contact form. In order to really make this count, you need to make sure you’re counting these events as Goals – so you can track which channels are performing best: driving the most qualified leads or generating the most value for your company. Rather than just counting which channel drove the most Leads, start saying which channel drove the most successful business. There it is. You have the knowledge, you have the freedom. Unleash the true power of your web data with Events and event Goals.